Beloved (Ret.) 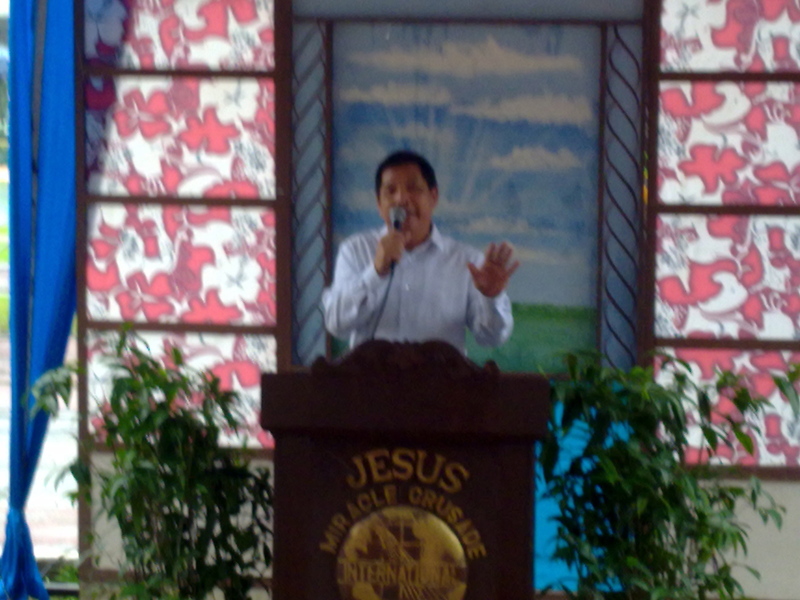 Major Bobby Naguit testifying in the pulpit during JMCIM Sunday Service at Amoranto Stadium, Quezon City, Phils. on Jan. 8, 2012. Every time beloved (Ret.) Major Bobby Naguit, a former Satanist, stands in the pulpit to testify, I feel the powerful anointing that emanates from his testimony – a testimony of how all-powerful and merciful God is! Our God is mighty to save even from the hands of Satan – literally! And his testimony doesn’t fail to bless me. The following is a direct translation of his testimony which was recorded while he was testifying on the pulpit on January 8, 2012, Sunday Worship Service at Amoranto Stadium, Quezon City. Because of the sensitivity of the material, great care was taken to translate his testimony word for word, him speaking directly. There was also a need to change the names and omit some of the places he mentioned, to protect the privacy of those people. This testimony was translated and shared with the purpose of giving glory to God – that He is all-powerful and His love and mercy are beyond comparison. Also, to let the world know that there is a God who saves, who gives hope, who forgives however sinful a person is, solves problems, makes all things new, and brings true peace and joy! Halleluiah! Praise the Lord! Let’s give the Lord Jesus a hand of applause! First of all, I greet our dearest Lord Jesus a very pleasant morning. Secondly, I greet our beloved parents-in-the-Lord, our beloved Hon. Pastor Wilde E. Almeda, the last prophet. To all his beloved children and all the beloved brethren in the faith! Beloved brethren, I’m here once again standing before you. It’s been quite a long time since I last testified. To all of you who are newcomers, I am a retired major of the Philippine Army during the time of General M and General PC. You know beloved brethren, before, I didn’t believe in this kind of fellowship or congregation. I was born a Catholic, then later on became a member of Iglesia ni Cristo, but now, I belong to the JESUS MIRCLE CRUSADE INTERNATIONAL MINISTRY. I’m going to relate to you how I arrived in this congregation. I started in the Philippine Army and was assigned in Jolo. When I came back from my deployment in Jolo, Gen. M and Gen. PC took me when **** was formed during the time of [Pres. Ferdinand] Marcos. And after ****, there was **** under Gen. M. I was assigned in SOG, Special Operations Group, and we handled cases like anti-economic sabotage and anti-dollar salting. You know beloved brethren, I started just an ordinary man: I was contented with my life and with whatever I had. I became greedy when I began working as a military officer. When I was assigned as head of SOG, I had men under me who were assigned in the field to catch those people who were involved in economic sabotage. I told my men to do their work well and follow the law. “What portion?” I asked. “Sir, we caught somebody and we settled it, so, that’s your portion.” He answered again. So, that’s how it started. At first, I was really wondering why my men, being ordinary agents, could buy cars, afford to have other women and spend extravagantly. I later learned that this was how they operated. Because I didn’t have the Spirit of the Lord then, I accepted everything that was given to me until I was no longer satisfied with what I received. So, the amount became bigger and bigger. You know beloved brethren, a person who doesn’t have contentment in life will come to adversity. Remember that always. “OK, sir, no problem, wherever you want to send me.” I answered. “What is it, sir? I am a military officer.” I said. “Yes, but I still have one requirement. You must become son of Satan.” He answered. I was taken aback! “Son of Satan? Satanas? Sasa…satan?” I stammered. “Yes. I’ll explain it to you later,” G answered. I hadn’t accepted this yet but I was already “in” as security officer and the work was difficult. It was high-profile. Sometimes it was highly-confidential. There was legal and there was illegal. “Before I can trust you, you must be son of Satan.” He told me. I said, “Son of Satan. This is the first time I heard it. OK!” I answered. Because I was so greedy with money, at that time I was receiving $400-a-week plus my salary plus my allowance plus – and this was the best part – the most sophisticated guns that were issued to us. The first uzi, micro-uzi here in the Philippines, I was the first one to have. Gen. R was only second. “OK, here’s thirty thousand pesos. I want you to buy a child which is 3-days-old.” Three-days-old! “OK, no problem.” I said. I went to a government hospital near Central Market. I met some doctors there. I bought a child worth P30,000, girl, 3-days-old. We all rode our cars, his back-up, and we went to Baguio, to the highest hotel there that has now become a haunted house. There, we offered the child to Satan. G was marked with 666. I couldn’t believe it, but when it was my time to be called – I experienced cruelty! You know beloved brethren, one o’clock in the morning, we offered the 3-day-old child. It was placed in a square glass box and under it, there was a funnel and a chalice to collect blood. Then G prayed in Latin and after praying, he stabbed the child […] Its blood was collected in the chalice. Then we drank the blood, all six of us who were new. You know beloved brethren, sometimes I really don’t want to relive this many, many times because it’s very hard. It’s very painful. I was shaking. I was shaking not knowing what had entered my body and I felt like I wanted to vomit, like I was losing my mind, I didn’t now! Soon after that, maybe after about 3 or 4 hours, in the morning after we were done, my feeling had changed. It had changed! It was so until – everything that I was told to do, I did! (A long silence here because beloved Major Naguit was weeping). I’m sorry. I wish I didn’t have to relive… (still crying here). You know beloved brethren, it’s really hard when you’re not with the Lord. When they tell you to kill, you will kill, without any reason. When you are told to do something, you will do it. Devoid of love. Even my wife, my children – nothing! Love was gone, beloved brethren, I didn’t know. (More weeping). But I’m giving thanks because the Lord’s love for me is great! You know beloved brethren, the more I was committing sin, the more I felt heavy inside. But I was becoming braver because I wanted to drink blood often. I wanted to smell gun powder often. Then there was a transfer of government from Marcos to Cory [Pres. Cory Aquino]. One time, I was close-in with him [G]. I was with Sergeant F and two of my men. We were inside a club, because we frequented clubs. We would enter ****** in Makati. We would order them to close it at midnight until dawn. When he would call me and instruct me to call Switzerland, he would give me the code and tell them to send this amount of money. Only serial number. After a month, millions of dollars would arrive. Then, the bank would bring it to us. They brought it to the house, we didn’t withdraw in the bank. That’s how rich Satan is. One day, we were escorting him [G] inside the club. Only a table separating us, one o’clock in the morning… When we drank then, Russian vodka, one bottle. G didn’t eat, he only drank wine. You would marvel at his life when you see and know him. We were inside the club and we were about to leave, beloved brethren, when a big man stood up, opened his jacket and upon opening it, he released a fine Ingram and aimed it at us. The intention was to kill G. What I did as security officer, I pushed G, I didn’t have time to pull my gun. After I pushed him, two bullets hit me and entered my stomach. White cutter with double action went through my flesh which destroyed my internal organs. At that instant when I was shot… Remember beloved brethren, this had happened in my life. No money will be called, no rank, no degree… You will not call any doctor or anyone. You will call only one name – the Lord Jesus Christ! The Lord is so good! He gave me a chance to repent. There were many who weren’t given the chance to repent. But I was given the chance by the Lord to repent so I could serve Him! So that I could say that the Lord lives! Satan has power but it has limitation. But the power of God reaches the heavens! No limits! When beloved Maj. Naguit was brought to the hospital, he was pronounced “dead on arrival”, but according to the doctor, he revived in the morgue so he was brought to the operating room. When he woke up, the doctor told him what happened and said that God gave him a second life probably because there is something God wanted him to do. Major Naguit stayed in Makati Medical Center for about a year. This was in 1987. On his 8th month in the hospital, he told his sergeant to switch on the TV and it opened to the program of the JESUS MIRACLE CRUSADE INTERNATIONAL MINISTRY. Three times within a month, the TV opened to the program of JMCIM but he ignored it. In 1992, while he was walking in Luneta Park, Manila, after making a collection in Binondo, he passed by the Quirino Grandstand and saw the on-going crusade of JMCIM. He recognized it and stayed for a while to observe. During that time in the Philippines, there was El Nino phenomenon. It had not rained for many months. Beloved Hon. Pastor Evangelist Wilde E. Almeda of JMCIM declared that the following Sunday, May 10, he was going to pray for rain and even invited leaders of other religious groups, the police, the military and even from the side of the New People’s Army to witness the miracle that was going to happen. Maj. Naguit was so angered by the beloved pastor’s declaration and said to himself, “We’ll see who is more powerful between us!” He went back on May 10 fully prepared to rain bullets to the beloved pastor once his prayer for rain was not heard. He had prepared his gun, feeding it with the “usual” ritual. When the beloved pastor stood up and raised his hand to pray, Maj. Naguit testifies that the skies darkened, thick clouds gathered, a powerful lightning flashed with a loud thunder, then the rains poured out. He was so shocked he couldn’t move. He was frozen from where he was standing. Then he felt a terrible shaking while copious tears poured out from his eyes. While the rains continued to pour out and he was completely drenched, he was also crying uncontrollably. He couldn’t understand what had happened to him! On the next worship service, he went back and this time, he desperately cried out to God, “Lord! Give me peace in my heart! Bring back love into my heart, I beg you! Give me peace and love and I will serve You all the rest of my life!” Beloved Maj. Naguit received the Lord Jesus Christ and was baptized in water in His name. He was completely changed. His beloved wife and children saw and felt the change, and they gathered around him and lovingly showed him how much they had longed for him and his love and how much they had yearned to show their love and care for him. He received the love, peace, and joy that he had been longing for! To this day, beloved Major Bobby Naguit continues to serve the Lord faithfully.